Today’s guest post comes from Emily Horton. The holiday table I grew up around was never fiercely rooted in tradition. Our menu seemed always to be searching for itself, and we had so many dishes on rotation that I can’t remember a single Thanksgiving or Christmas Day feast in its entirety. But there was one dish whose absence could prompt fits: plain, steamed rice. More than once, friends in the small Georgia town where I lived asked why my family had something as un-American as rice on our holiday menu. The reason was, according to my mother, to appeal to my father, whose mother always served it. This explanation was functional—basically, because Dad says so—but unsatisfying. It wasn’t until a few years ago that I traced our Thanksgiving rice, which had come to us by way of my South Carolina-born great grandmother, to the agricultural commodity that anchored that state’s economy from the late 1600s until just before the Civil War. Rice was not native to the lowcountry region of the Southeast, or even to the Americas, but colonists planted Madagascar seed rice and realized that it flourished in their boggy soil. Slave labor and expertise—plantation owners sought out and offered higher prices for slaves from rice-growing regions of West Africa—built rice into an industry that brought tremendous wealth to South Carolina and Georgia, until the Civil War and the abolition of slavery rendered it largely unprofitable. The Southern grain that wooed world rice markets was a non-aromatic, long-grain variety called Carolina Gold, prized for its delicacy and culinary versatility. Its fragility, however, made it especially prone to fracture. Female slaves worked with a mortar, pestle and winnowing basket to hand-pound the grains and release the chaff, but even this tedious technique resulted in 30 percent broken grains (a rate never improved upon by modern equipment). And yet local cuisine didn’t suffer for the rice’s character flaw. Nearly all of the intact grains were exported, but Carolinians developed a special fondness for the faulty brokens, or middlins, that stayed at home. It’s easy to understand how the locals were smitten. In flavor, rice grits, as they’re known today, mirror the whole grain; they are sweet and clean on the palate, a canvas that partners gracefully with virtually any sauce. But it’s their structure and texture, faintly resistant to the tooth, that’s the hook. Rice grits cook up with a texture that’s creamy, sticky or pearly depending on how you treat them. In the 1800s, a bowl of rice grits might have been accompanied by a glossy sauce of peas, thickened with nutty, faintly bitter bennecake, or sesame seed flour—a dish thick with the influence of the West African cooks who sculpted much of the culinary culture of the lowcountry. 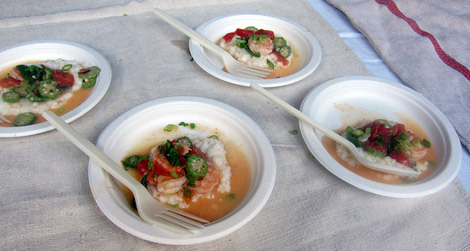 Today, chefs who are looking increasingly to the region’s traditional and, in many cases, forgotten, foodways, are working up similar preparations—serving rice grits with oyster stew or swapping them for corn grits, and creating an arguably more authentic take on the shrimp and grits that dominate regional Southern menus these days. But restaurant kitchens committed to defining the cooking of the new South are also taking advantage of rice grits’ flexibility. Their variations on rice middlin risotto might have you addressing the Veneto region’s revered Vialone Nano variety with a shrug. Sound advice I could have used more than once, but I fancy rice grits best amid joy and good company. I hear they take well to gravy. Emily Horton lives in Washington, D.C. and writes about cooking and traditional foodways.